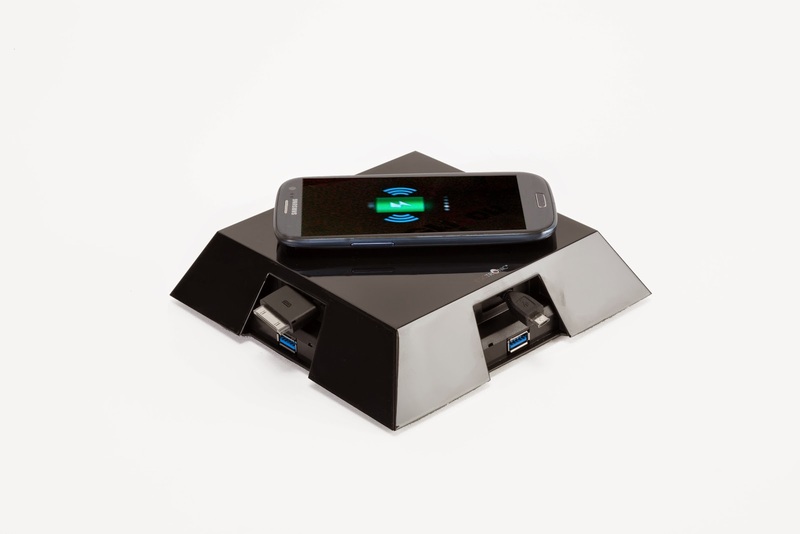 Modena, Italy – December 15, 2014 - Eggtronic, a cutting-edge designer, and manufacturer of mobile device & consumer electronics accessories solutions, announced today the addition of Qi wireless charging functionality to it's versatile and highly customizable sync and charge station HUB IT. The Qi wireless charger cartridge, available for sale on Amazon, enables HUB IT to service and charge any Qi-compatible device. The Eggtronic Qi Wireless Charger Cartridge is an accessory compatible with the Eggtronic’s HUB IT – Sync & Charge Station. With a total of twelve different cartridges, HUB IT’s modular design allows users to easily build their charging station enabling them to select and install cartridges on the fly, whether they are connecting a micro USB device, Apple lightning, a Galaxy TAB, a Nintendo DSi or any other electronic gadget, including the most demanding tablets. The Qi Wireless Charger Cartridge is the best wireless charging standard, developed by the Wireless Power Consortium: it employs electromagnetic induction technology to produce a magnetic field that in turn generates an electric current to charge the batteries in devices placed on the charging pad. The Qi Wireless Charger Cartridge is compatible with all smartphones that support the Qi standard. Additional Qi wireless charging cartridges can be added to recharge even more devices simultaneously and wirelessly. Eggtronic offers a range of high-quality Qi wireless receivers for the most common smartphones, developed to ensure a complete Qi wireless charging solution to the consumers. Combining the aesthetics of Italian design with advanced USB 3.0 technology, HUB IT delivers a sleek and compact power source package with a 2.5A powerful output per port at a speed of up to 5Gbps. This high-speed seven-port desktop syncing and charging station boasts three USB 3.0 SuperSpeed ports and four retractable cartridge connectors, which can be changed and upgraded with the latest connection format. HUB IT is perfect for quick and convenient charging access anytime on desks, counters, or nightstands for all household portable electronic devices. “It's exhilarating to see the addition of a new accessory to the HUB IT cartridge’s library. With Qi wireless charging compatibility, HUB IT continues to evolve and offer the latest charging technology to its customers” says Igor Spinella Founder and CEO of Eggtronic. The following HUB IT cartridge connectors are available now in the U.S.at amazon.com. About Eggtronic Eggtronic is an Italian based designer and manufacturer of consumer electronics products, mobile device accessories, and innovative technology. Established in 2013, Eggtronic brings to the portable scene its Italian design know-how, quality, and passion for extreme attention to detail. Through a substantial commitment to innovative and original designs, Eggtronic produces stylish and functional premium accessories. Eggtronic’s products are exclusively sold in North America in leading consumer and electronics retailers, mobile retailers and through www.eggtronic.com.